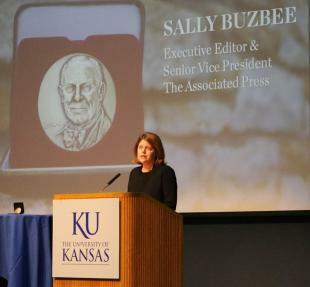 As she accepted the William Allen White Foundation National Citation for outstanding journalistic service at the University of Kansas on Thursday, AP Executive Editor Sally Buzbee outlined three guideposts news organizations must use to navigate the future of journalism. We live in a moment when the news industry — the journalism — that we all strongly believe in faces many challenges. Misinformation and extreme partisanship are widespread. Technology innovations — as wonderful as they are — have proven in recent years to be enablers, things that can be manipulated to very bad ends by those who push misinformation and partisanship. And the people who attack journalists — either verbally or physically — have been emboldened all the way from Washington to places like Poland, where last year, one of AP’s reporters was called out and threatened by name on Polish television by a high-ranking government official — for supposedly writing “fake news” — after she accurately reported what had taken place at a rally of far-right nationalists. These things are happening at a time when the business models of journalism are under challenge, leaving a stressed news industry knocked back on its heels and short of money and confidence. To navigate these challenges, Buzbee explained that newsrooms must embrace innovation and put it in the service of good journalism. She also addressed the importance of collaboration, both between news organizations and with outside groups who fund may fund reporting. What makes news organizations valuable is that they tell people what’s going on. 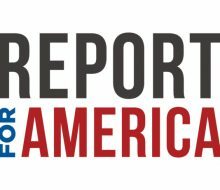 We report — we find things out — and we bring that information to people. This seems so obvious. And yet in all the worry about the future of news, we sometimes are in danger of losing sight of it. There’s a lot of hand-wringing right now that no one believes in facts anymore. I don’t think that’s true. There’s powerful evidence that most people still let facts guide the vast majority of their lives. What is true is that humans always tend to resist uncomfortable facts, especially if they conflict with their beliefs or views. That is precisely why accurate reporting matters. The need for that good, fact-based reporting never goes away. Societies never get to a perfect point. They always need the steadying flow of real accurate information to keep them grounded — whether it’s a small Missouri town trying to figure out the extent of a drug problem or Syria, after the Islamic State, grappling with what to do with refugee women and children. So that’s what I try to focus on when people get grim about the future of news: these three things that could help guide us through this rough patch. I think of it this way: Hold on to the bedrocks of the past that have made journalism strong: the focus on facts, the accuracy, the credibility, the “not taking sides” part. The training and the processes that our journalists have that make us strong. In other words: The things that I learned here from great professors like Susanne Shaw, Ted Fredricksen, Tom Eblen. And from great working Kansas journalists like Lew Ferguson. But on everything else, be bold — embrace the new. Be bold on how we present our journalism. On who we partner with and collaborate with. On the innovations we’re brave enough to give a try. Take a risk on all that. Be bold and confident. And I think we’ll get there.